So my first week has been and gone of University and I'm writing this post at 10:30pm after finishing off my dissertation proposal form and ethical approval application form because student life and everything; why the heck not? My eyes are absolutely stinging, I'm shattered and I've already had a nap today after uni but I'm still going! So I go to University every Monday and Wednesday so now I have the joys of finishing my week off with two days of work before the weekend filled with lots of fun uni work, yay! On a Monday I have one module which is currently Children's Rights. It's an easy module which consists of a presentation (newspaper) and an essay which are both due in January. On a Wednesday I have my dissertation lecture in the morning and my Practitioner 3 lecture in the afternoon; Practitioner 3 is all about work based learning and implementing a research project into my work; it's very intriguing! So lets get to the nitty gritty part of University and how crap it truly is. I started my dissertation back in May and I've had to wait until yesterday to be able to do all of the paperwork side of it before I can officially start because my tutors are insanely unorganised and bloody irritating. Not only did my personal tutor go on long term sick in the summer, but the university did not find a replacement for her either; absolutely brilliant. So while we all want to get cracking, we can't. Up until last week I didn't have a tutor for any of my modules, let alone did we have a timetable which was correct or any module guides; in fact we still do not have the module guides for two of our modules; even more perfect. I'm not sure if every University is as crap as mine, but I couldn't be more relieved that this is my final year because there's absolutely no way I could do another year of their unorganisation; it drives my absolutely insane. Something I would like to do more of here on my blog is posts relating to how I balance time with my University work load as well as the basic rights of having a social life while also earning money. If there is any posts you would like to feature, please feel free to either let me know it the comments of this post or let me know via one of my social media links down below! How's University, college, sixth form or school going for you right now? Or even work if you're not in education. I remember my 3rd year. Just remember working all the time. I did also have part time job though so I could eat. 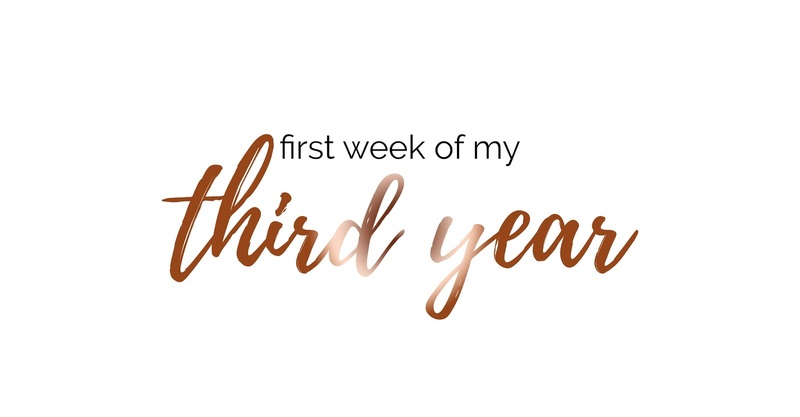 Hello, fellow third year ! I just had 2 lectures today and I cried in both classes due to the work load that we have this semester. Apart from the work load, we have the dissertation and the placement. IT IS SO STRESSFUL! We just gotta fight through it. It will all be worth it in the end !